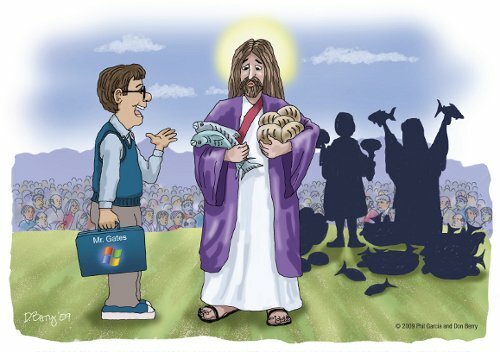 You are here: Home › Blogs › Community › Windows 7 Sins now in 9 languages! Windows 7 Sins now in 9 languages! Our campaign for computer user freedom, Windows 7 Sins, now has 6 language translations available with several more on the way. The translation effort, coordinated by FSF campaigns staff working with volunteer translators, has been gathering pace over the last few months. All the work has been done using free software tools with our collaboration efforts achieved via the GNU Mailman software. The first translation to go live was French, translated by members of the French activist organization, April. "I'm sorry, Mr. Christ. You're only licensed for five loaves of bread and two fish." By translating Windows 7 Sins into as many languages as possible, we are making this an international campaign for computer user freedom. One way everyone can help the campaign is by putting a link to windows7sins.org on a website or blog you control. We have a widget which you can easily put on your site, and help increase our ranking in the major search engines -- meaning that when people search for 'Windows 7' they will see our campaign listed as well. Translations allow non-English speaking readers to understand the stakes of FSF's campaign. With the French translations, April and Framasoft called on the French speaking Free Software community to take advantage of the release of Microsoft Windows 7 to inform their friends, family, colleagues about the dangers of proprietary software, Microsoft unfair practices, and the existence of Free Software.